The Aye Write! Festival has been running in Glasgow since 2005, and has taken place annually since 2007. It showcases a blend of the best in Scottish and international writing talent as bloggers, authors and publishers come together to offer an insight into their world. The festival is organised by Scottish Libraries and has a range of literary events for young and old alike. The festival takes place each year at the end of February or beginning of March and the festival events cover a wide range range of topics; anything from football to tango may be discussed, there may be events which focus on history while others analyse the internet revolution. There are both free and paying events and an award winning children's programme too. The Aye Write! Book Festival events are held at The Mitchell Library near Charing Cross train station in central Glasgow. The location is very easy to reach with the St George's Cross Underground station just a short 10 minute walk from the library. 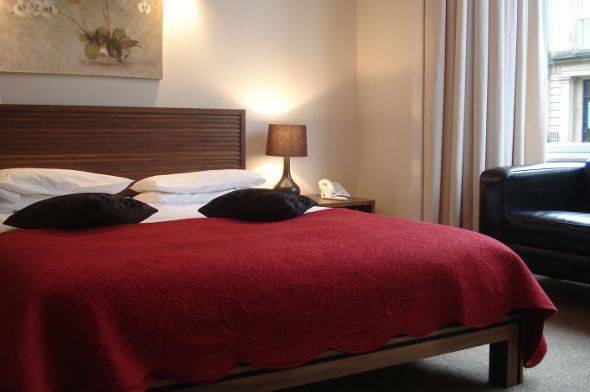 The Sandyford Hotel is one of the Glasgow hotels offering B&B accommodation near the Aye Write! Book Festival. You will find we are conveniently located between the West End and the City Centre of Glasgow. Our hotel, with its 55 en suite rooms, is an affordable, comfortable and friendly family hotel which is perfect Aye Write! Festival accommodation for visitors as it is within walking distance of The Mitchell Library where all the festival events are held. At the Sandyford Hotel we provide bed and breakfast accommodation with a full Scottish breakfast for festival visitors. To check on availability and book one of the cheap, quality rooms at the Sandyford Hotel, please call us on (+44) 0141 334 0000 where our friendly reception staff will be more than happy to answer your queries. Alternatively you can submit a booking enquiry through the online reservation system on this site to book your hotel near the Glasgow Aye Write! Book Festival.